…Am I the last to know? What… You think Rex Ryan doesn’t take an occasional snack break? And if that’s “not bad” vocals I really need to get into the Danish music scene, keep listening. Loved it dude … keep them coming!!! 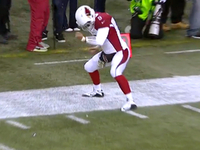 The best moment of NFL Sunday was Drew Stanton celebrating Andre Ellington's touchdown run against the Seahawks on Sunday night. We will not debate this.